For ither uises, see Basel (disambiguation). Basel (/[unsupported input]ˈbɑːzəl/) or Basle (/[unsupported input]ˈbɑːl/; German: Basel; pronounced [ˈbaːzəl])[note 1] is Swisserland's third maist populous ceety wi aboot 166,000 inhabitants. Locatit whare the Swiss, French an German borders meet, Basel haes suburbs in Fraunce an Germany. In 2011, the Basel agglomeration wis the third lairgest in Swisserland wi a population o 500,600 in 74 municipalities in Swisserland an an additional 53 in neebourin kintras (municipal coont as o 2000). 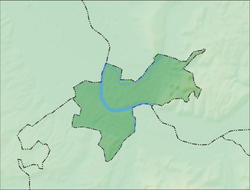 The tri-naitional metropolitan aurie haes aroond 830,000 inhabitants in 226 municipalities. ↑ "Eurodistrict Basel: Agglomeration". Eurodistrictbasel.eu. Retrieved 2010-03-08. Wikimedia Commons haes media relatit tae Basel. This page wis last eeditit on 8 Mairch 2018, at 05:27.